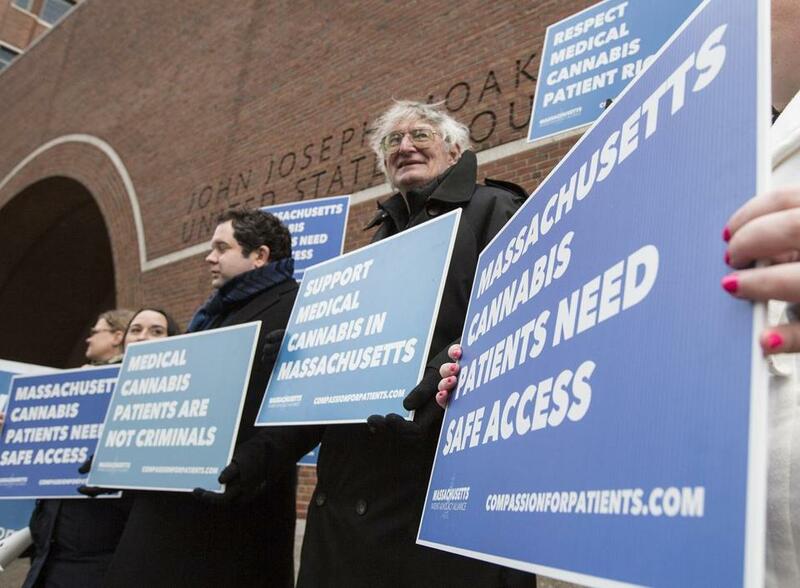 Protesters from the Massachusetts Patient Advocacy Alliance stood outside the John J. Moakley Federal Courthouse on Thursday in support of medical marijuana patients. 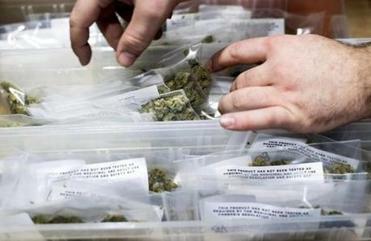 IN WASHINGTON, Attorney General Jeff Sessions has reversed Obama administration policies and freed US attorneys to prosecute the marijuana business, even where it’s legal. In Boston, US Attorney Andrew Lelling has given no assurances that he won’t. Meanwhile, in a nondescript Natick strip mall, in a physician’s office above a pizza joint and dance school, and down the hall from the Ebenezer Assembly of God ministry, Dr. Uma Dhanabalan helps patients use marijuana to wean themselves from an actual drug menace. That would be opioids, legally prescribed, government approved, a drug that’s made billions for the politically wired pharmaceutical industry and now kills nearly 100 Americans every day. “I hated them,” said Beth, one of Dhanabalan’s patients, a 52-year-old wife and mother, about the Hydromorphone and Oxycodone she was prescribed for pain from a herniated disc and osteoarthritis. The US attorney for Mass. should have clarified how Jeff Sessions’ comments regarding pot will affect drig proseuctions in the state. She also endured the indignities of another notorious opioid side effect: constipation. For that, physicians routinely prescribe yet another drug with side effects almost as horrifying as those of opioids. Opiod side effects include not just dizziness, drowsiness, mood swings, and confusion, but also addiction, accidental overdose, and death. “The nerve pain used to be unrelenting, like pushing out at the front of your consciousness,” she said. But the marijuana “put a barrier between conscious awareness and the pain. It’s still there, but like a shadow. It’s not banging. And I am clear-headed. Beth did not want her last name used. She has a teenage son. Stigma and unease remain. And both became worse when prosecutor Lelling called marijuana a “dangerous” drug he may, or may not, crack down on. The irony, said Dr. Dhanabalan, is that “nobody in the world has ever died from a cannabis overdose.” She calls cannabis “the exit drug” from opioid addiction, a controversial claim but one that is fast gaining traction. Sitting in blue scrubs, pictures of a marijuana plant on one wall and her medical degrees and a plaque from the Veterans of Foreign Wars on another, the former family physician said it’s hard to fathom the continued hostility toward, and ignorance about, cannabis. She said it’s helped not only patients kicking opioids but also those with cancer, PTSD, or common maladies like insomnia. “It changes lives,” she said. Surely it changed Daniel Snyder’s. A 64-year-old Stoneham mechanic badly injured in a tractor rollover, he said opioids helped his pain tremendously — at first. Married 43 years and the father of grown children who’ve lost close friends to overdoses, Snyder said he was “whacked out on pain meds ” himself when his primary care doctor recommended Dr. Dhanabalan. Now? His pain, opioid cravings, blood pressure, and weight have dramatically decreased.